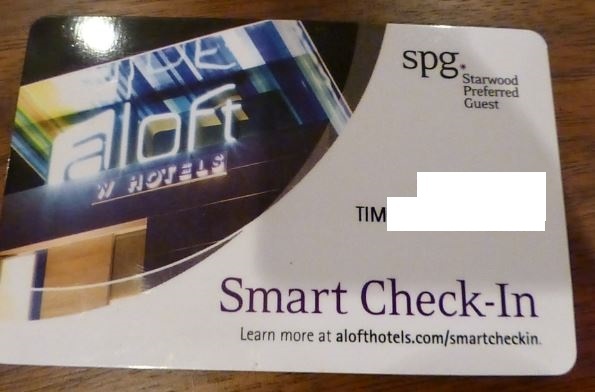 Last November I posted about an email I got from @SPG letting me know I’ve been selected for Smart Check-in at their Aloft Brand. If you opt-in you receive a special RF Room Key and on day of check-in the hotel will text you your room number. Upon arrival you can bypass the front desk and head straight to your room. There are definitely some benefits to this program and some pitfalls. One of the bonuses of course is just bypassing any lines and getting into your room straight away. The biggest pitfall of skipping the front desk is forgoing the possibility of an at-check-in room upgrade. I’ve never stayed at an Aloft that has suites, but they do exist (Dallas for one). The other issue is that this product isn’t available at all Alofts yet — they need to have the RF room keys vs the standard magnet strip keys. If I’m staying at an Aloft without Suites (like in Nashville where I stay quite frequently), I will skip the front desk. If this program expands to other hotels, I don’t know how frequently I will use it — find that I have to ask for an upgraded room at check in. I’d rather wait in line and go through the whole check-in process if I actually get an improved room. What do you think — would you use this program? Do you think SPG should expand this to their other brands as well? By Tim in Travel on February 10, 2014 .